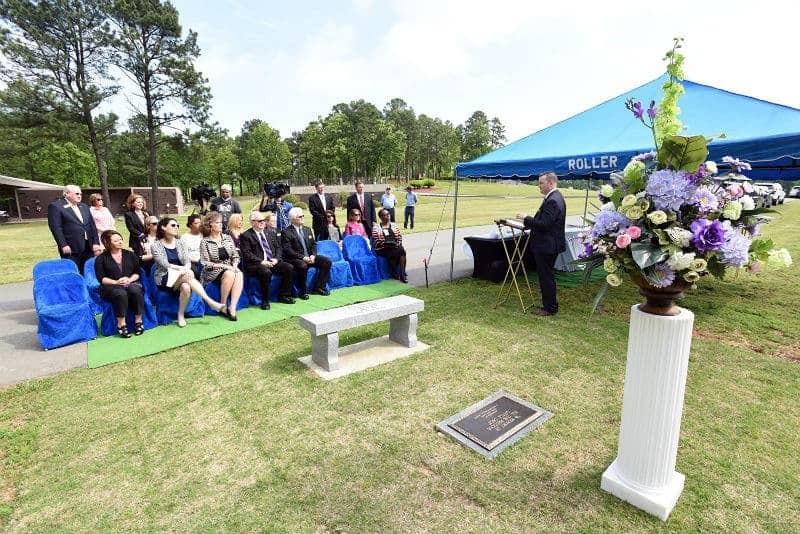 UAMS and Roller Funeral Homes dedicated the Love Lives Memorial at Riverwood Memorial gardens Cemetery in Maumelle in remembrance of pregnancy and infant loss. Renata Jenkins Byler, owner of Roller Funeral Homes, who helped fund the Love Lives Memorial, spoke at the dedication. May. 2, 2018 | May 2, 2018 | In memory of pregnancy and infant loss, the University of Arkansas for Medical Sciences (UAMS) Love Lives Program and Roller Funeral Homes today dedicated the Love Lives Memorial at Riverwood Memorial Gardens Cemetery in Maumelle. 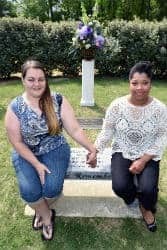 Love Lives, the UAMS perinatal bereavement program, worked with Roller Funeral Homes to establish the memorial garden as a final resting place for some. For others, it may be a consecrated place of quiet reflection where families and loved ones may come to feel close to their precious little ones whom they will always remember. Neonatologist Sara Peeples, M.D., an assistant professor in the Department of Pediatrics in the UAMS College of Medicine, said establishing the memorial garden recognizes that these losses have a profound and lasting impact on families. Parents can visit the Love Lives Memorial for a time of reflection on the little ones they lost. 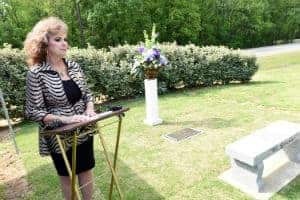 Renata Jenkins Byler, third-generation owner of Roller Funeral Homes, said the memorial is a gift to the families served by Roller Funeral Homes and UAMS. The bereavement program provides personalized care through family-centered support for those who have experienced pregnancy or infant loss. It provides the families with everlasting keepsakes as a remembrance of their baby, as well as education and ongoing support to help each family member as they journey through the grieving process.